Tanks a lot. 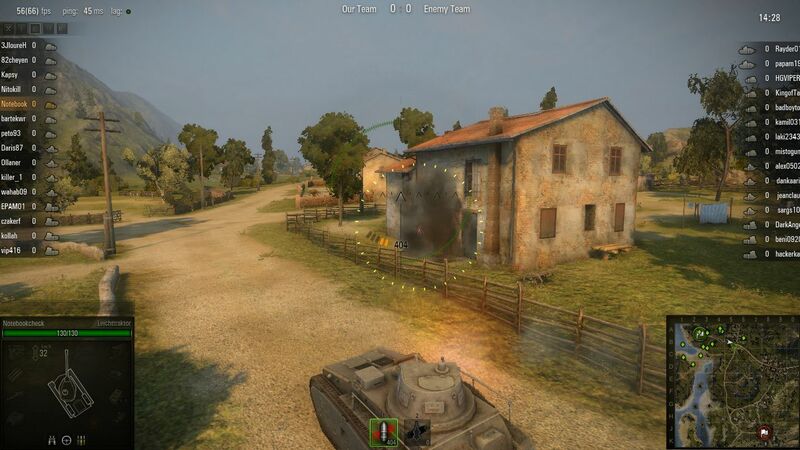 Over 40 million registered users and a bigger E3 stand compared to many (former) top publishers: Wargaming.net shakes up the Free2Play sector with World of Tanks. In order to investigate the ongoing trend we tested version 8.0 with a variety of notebook GPUs. 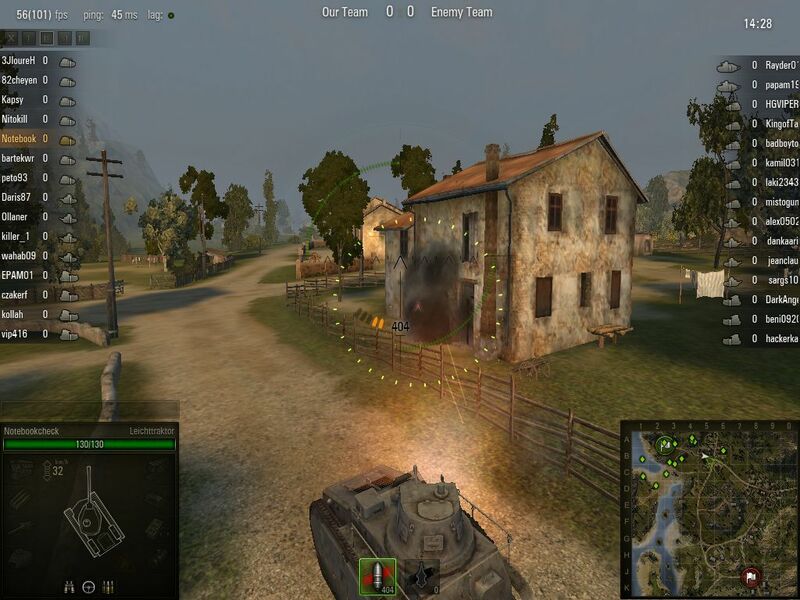 Developer Wargaming.net, founded in 1998 and based in Belarus, achieved its biggest hit in 2011: World of Tanks, a free to play online game which evolved into a very popular and successful Free2Play hit due to its absorbing and tactical PvP battles. The developers mainly make money by selling in game gold, a premium currency. 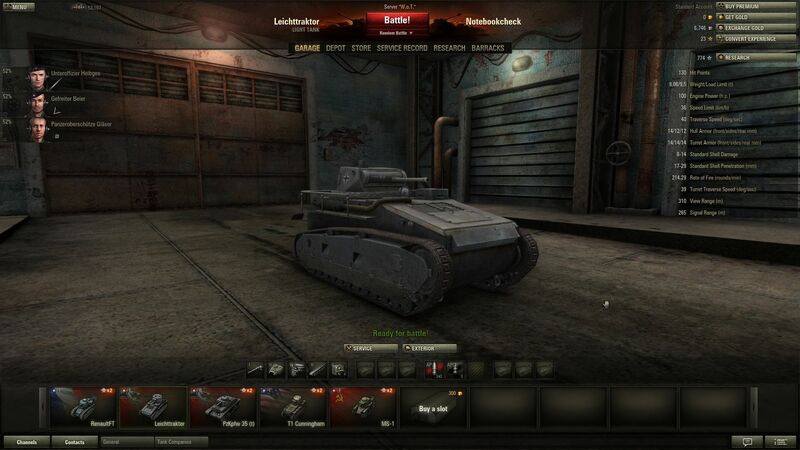 The users can use this gold to buy specific tanks and upgrades. Experience and earning bonuses can also be bought with real money. 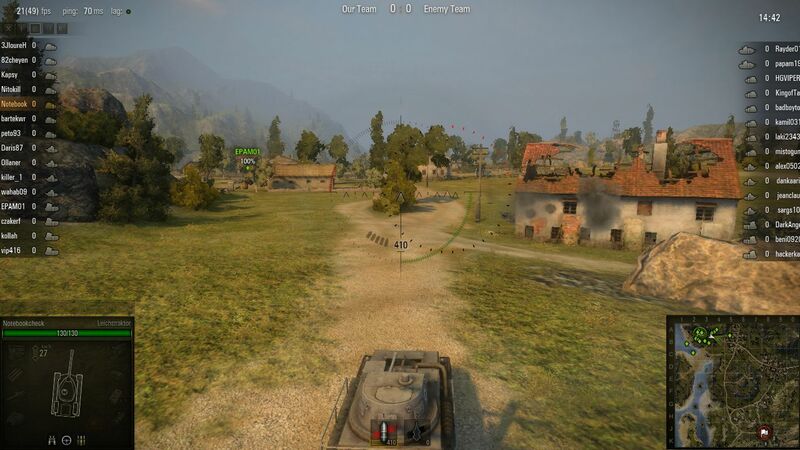 Unfair advantages do not exist in World of Tanks - the Free2Play game offers enough gaming pleasure for users who do not want to pay any money. 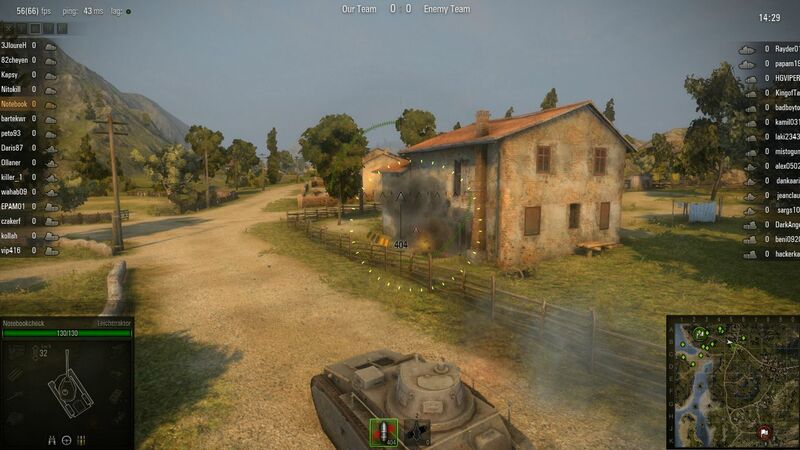 As the name implies, World of Tanks is about battles between tanks. 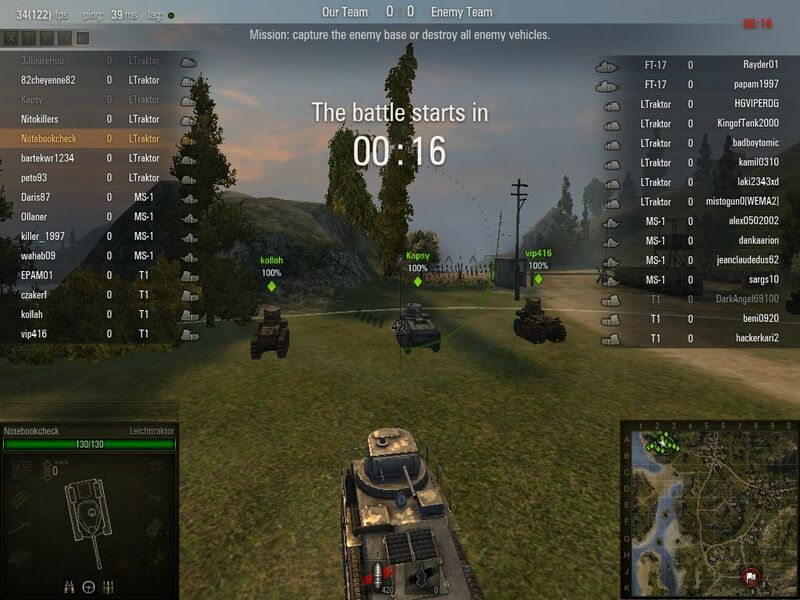 In the standard mode two teams, each with 15 players, compete on more or less open terrain in the competitive PvP mode. 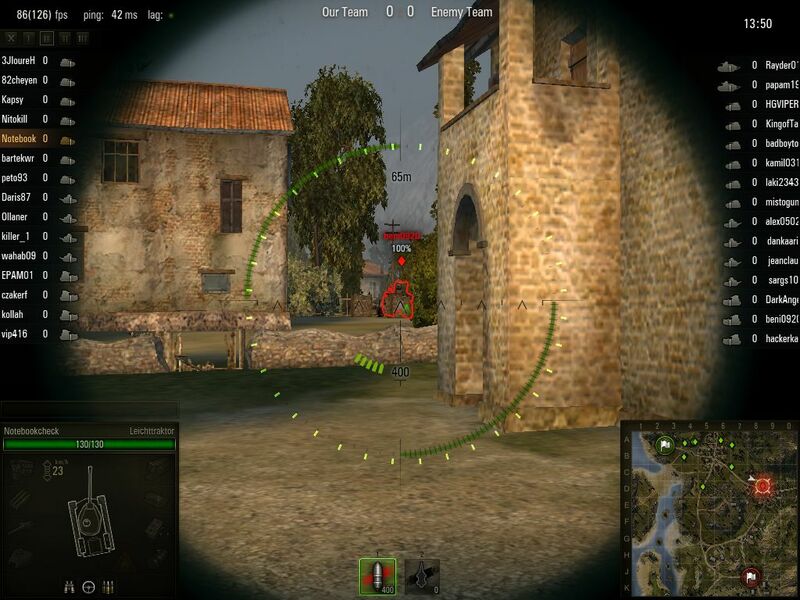 The goal is simple and exciting: destroy all enemy tanks or capture the flag zone of the enemy. 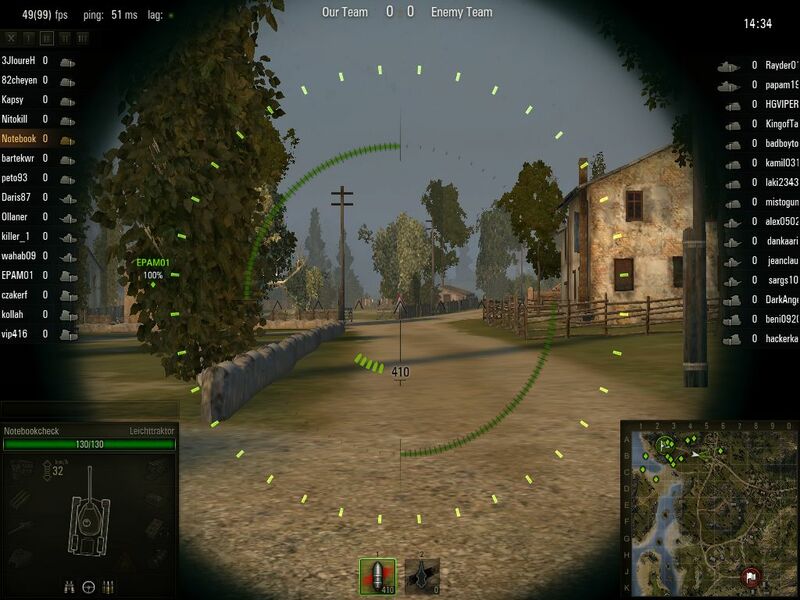 In order to get acquainted with the game controls and to get along during the thrilling battles you will need some time to accustom yourself to the gameplay. 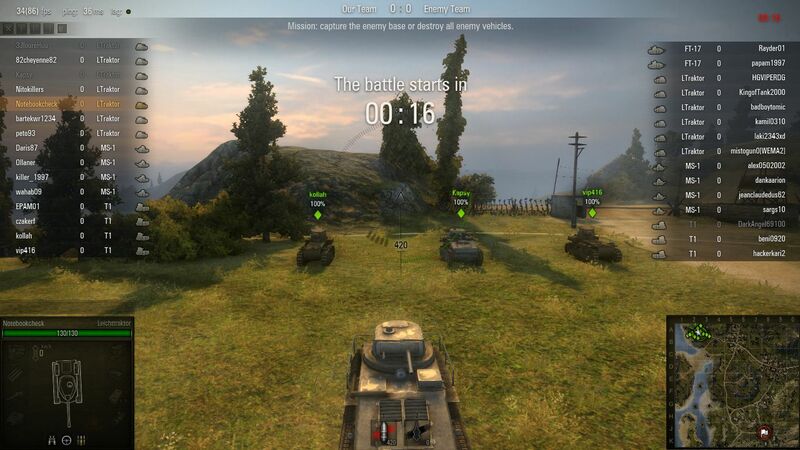 The main menu confuses newbies completely: dozens of icons and menu items can be selected. 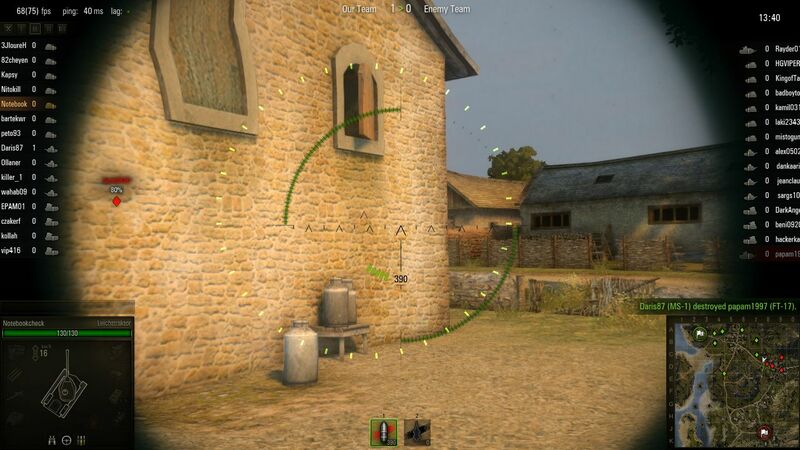 Next to the InGame-Store, the depot and the barracks; the research menu is especially interesting. 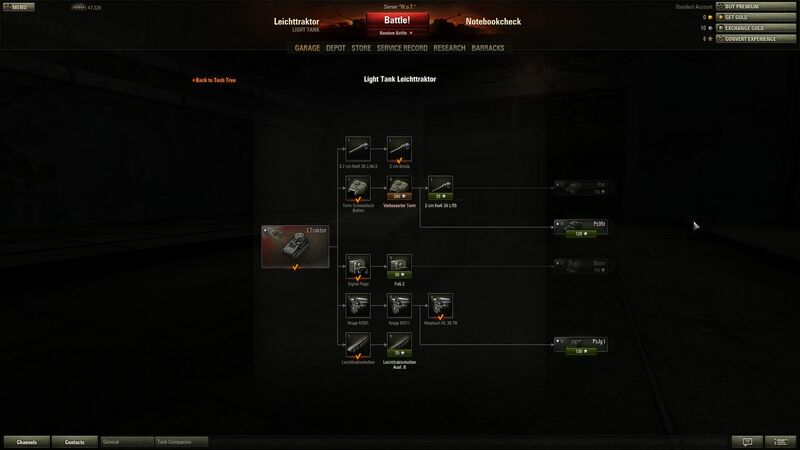 Here it is possible to buy new tank models and to upgrade the tanks you already purchased. Should it either be a better barrel or a stronger engine? In order to unlock all the items, an average gamer will need weeks, months or even years. Every nation offers dozens of tanks. 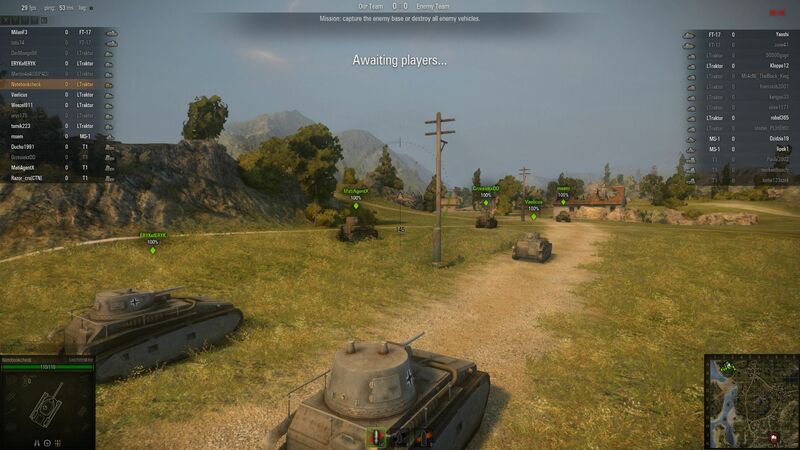 All the vehicles can be extensively upgraded. You have to get acquainted with the different menus. 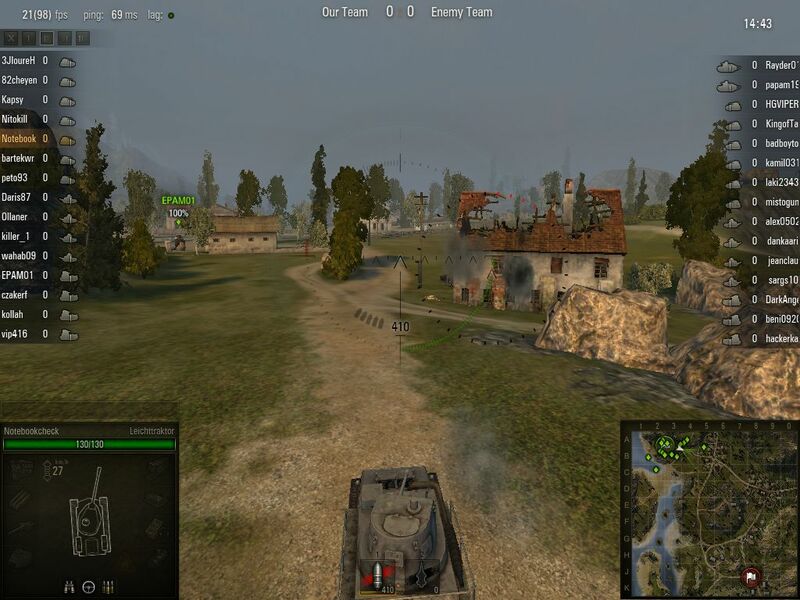 The battles themselves are played at a fast pace - depending on the tank you choose - without neglecting a certain tactic. 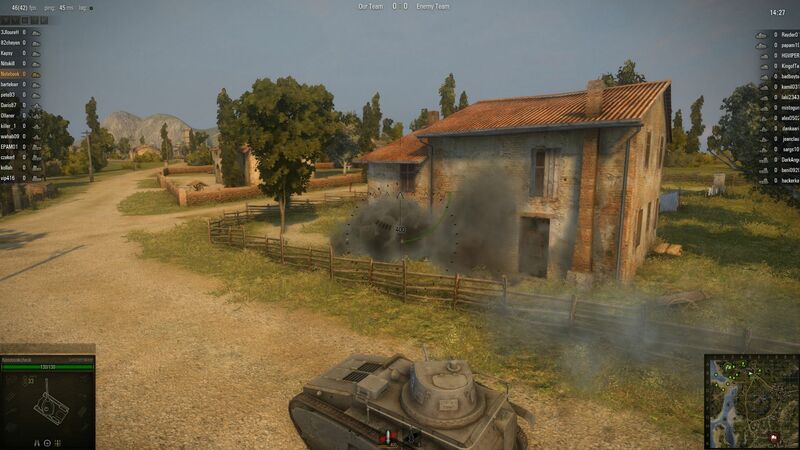 Am I going to confront the enemy in a direct battle or am I going to flank the enemy in a smart way? 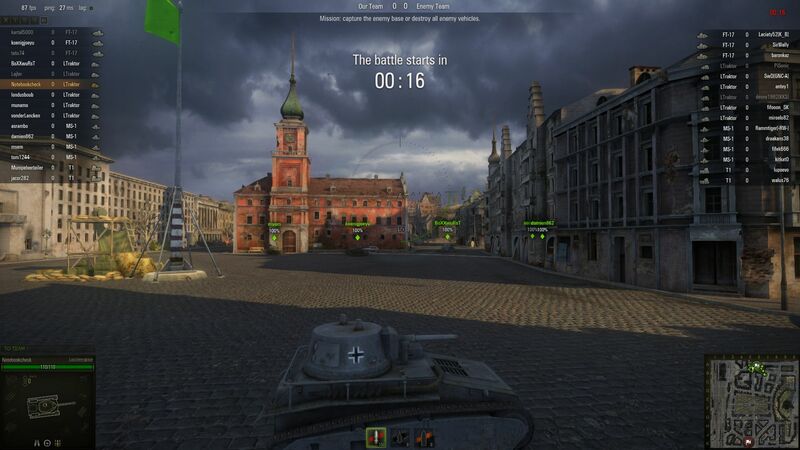 Thanks to the relatively short time a round takes (after 15 minutes the map usually ends) the game can be played anytime of the day. Distinctive buildings serve as orientation. 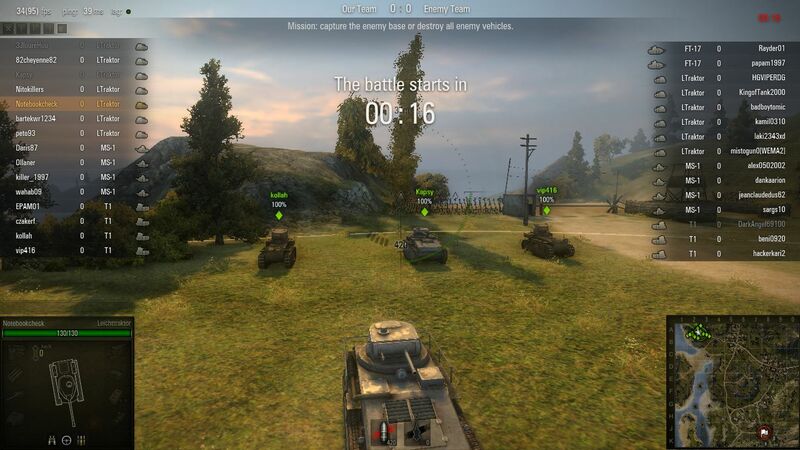 The game concentrates on team battles full of action. Some maps are quite idyllic. 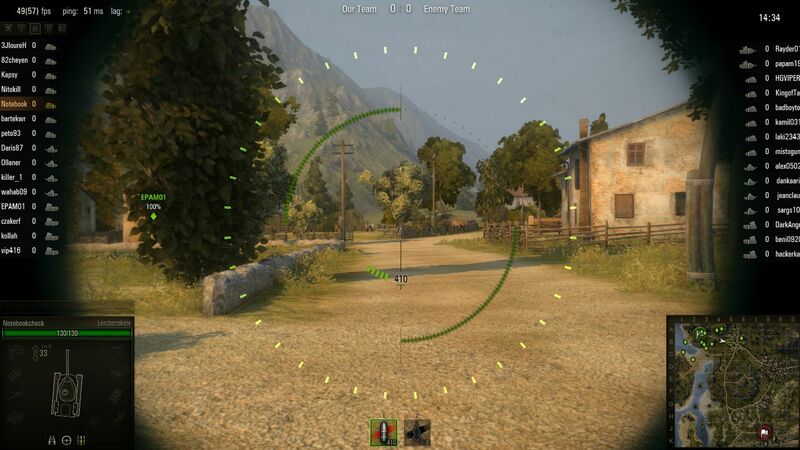 Having activated the item "battle recording" in the settings menu, World of Tanks saves all the completed battles. The recordings are located in a map of the same name in the game directory and can be replayed with a simple click. In order to guarantee comparability, we used a self-made replay during the benchmarks (see the video). Since every round starts with a 30-second countdown we skipped the initial phase using the key-combination Ctrl + right arrow. During the sequence of almost 1.5 minutes the tool Fraps will be used to record the average refresh rate. 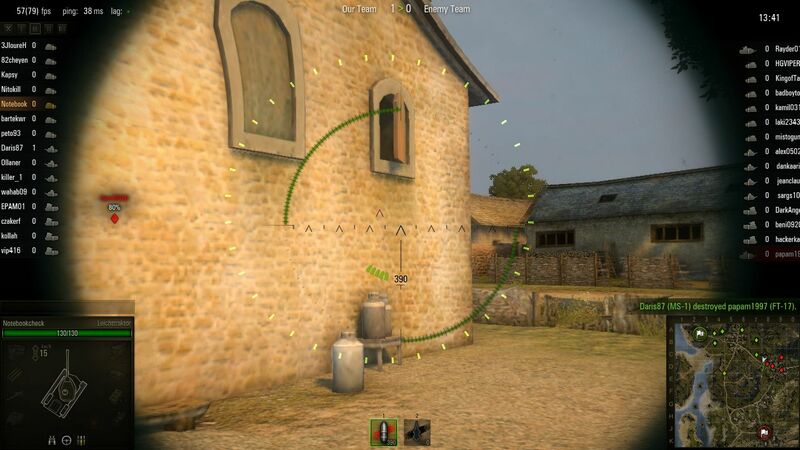 The played map "Mines" is, in our experience a bit more demanding than other maps such as "Himmelsdorf" (which in English means "Sky Village"), which is more compact and has a considerably smaller area of grass. 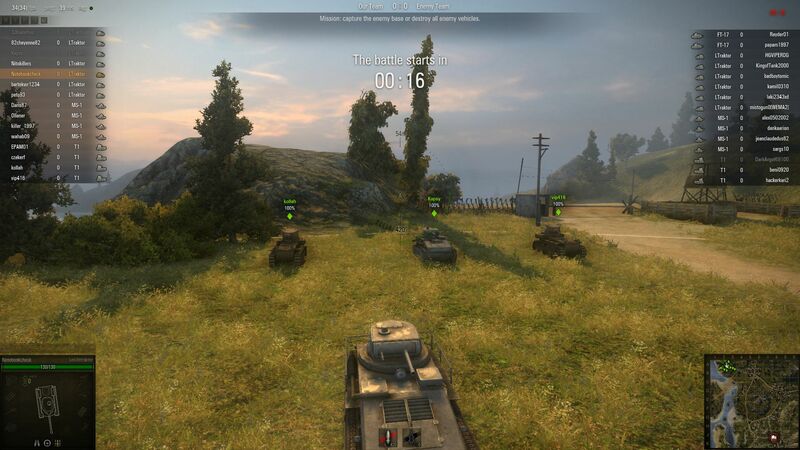 Depending on the environment you are in and how many tanks have to be displayed the frame rates fluctuate strongly. 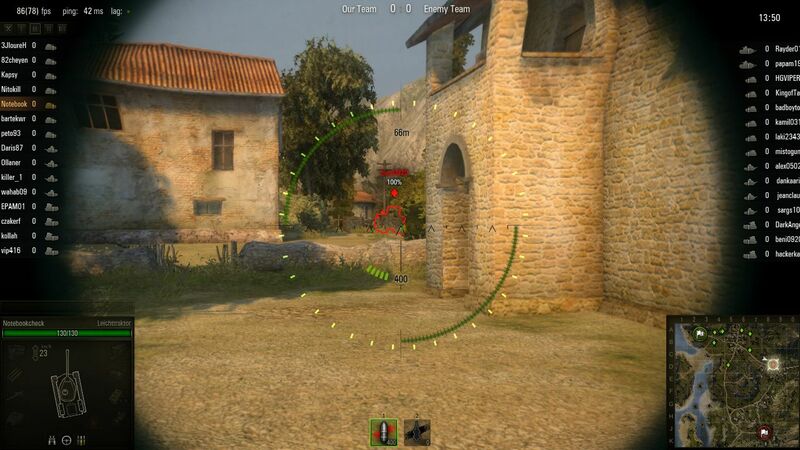 30 fps will be used as guiding value during our benchmarks in order to play the game properly. Let's discuss the change log of the eagerly awaited update. 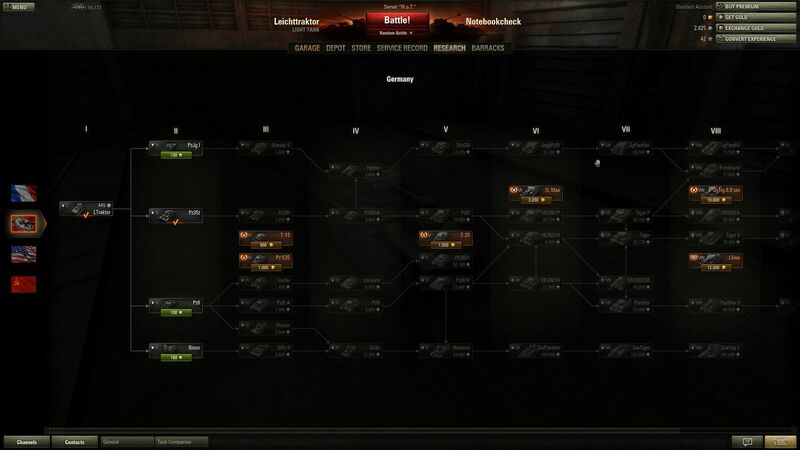 According to Wargaming.net, they did not only implement more tanks, design options and personalization options but they also improved the appearance. Especially the rendering as well as the lighting systems have been significantly revised. The same applies to the physics and some effects (i.e. water waves). Exemplary: the improvements of version 8 can easily be activated or deactivated in the settings (Standard vs. Improved). Overall we have to compliment the developer for the abundant graphics menu. Using the five different presets (Graphics Quality) the graphics can quickly be adapted to the capabilities of the your own hardware. 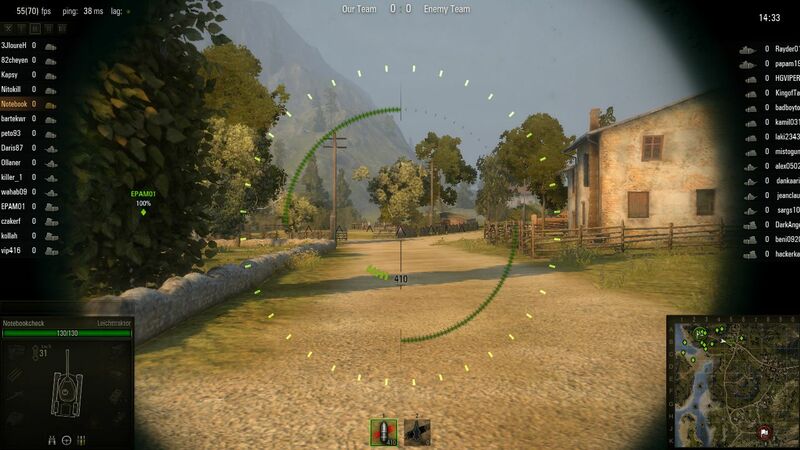 Contrary to Medium, High and Maximum, the minimum preset offers the old graphics level. The differences between the various graphic levels are considerable. 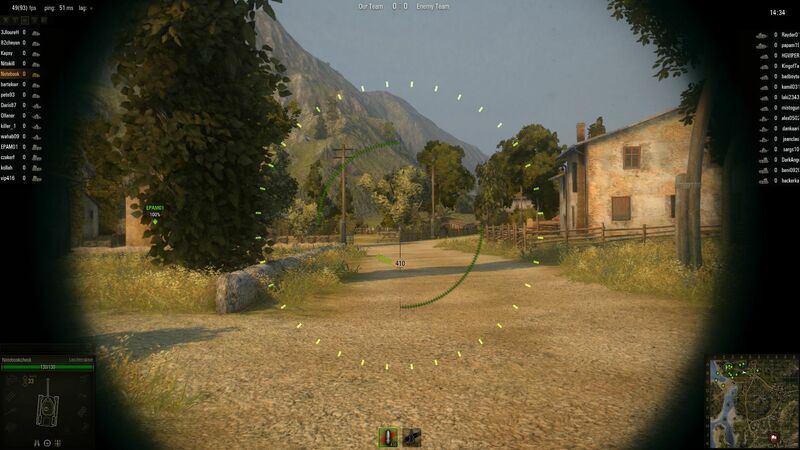 The minimum preset especially distinguishes itself from the other presets: weak textures, poor shadows as well as dull and barely existing lighting effects influence the atmosphere of the game. 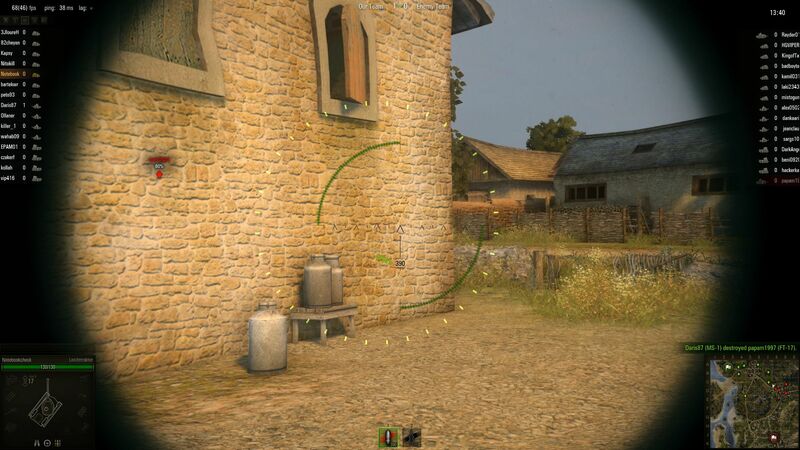 The quality of the appearance changes considerably starting from the medium preset, while the texture sharpness does not improve until the high or maximum preset. 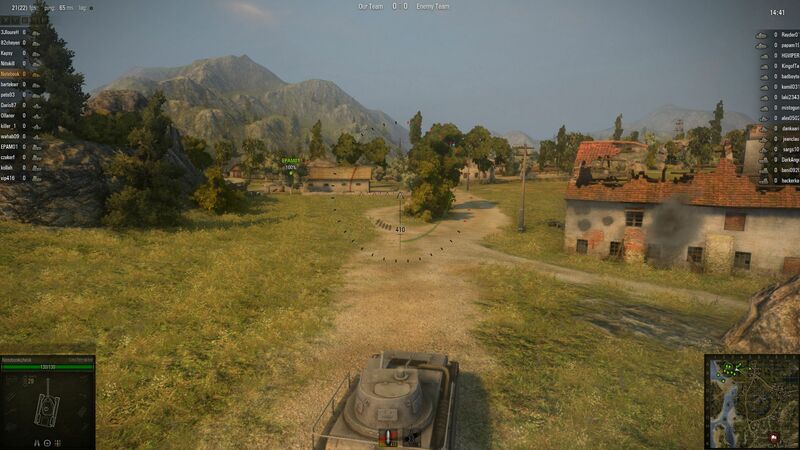 The higher the graphics setting the more grass is displayed. Next to the global presets and the 17 detailed options the graphics menu offers a variety of other options. Among these options are the resolution, gamma value, display mode, vertical synchronization and anti-aliasing. 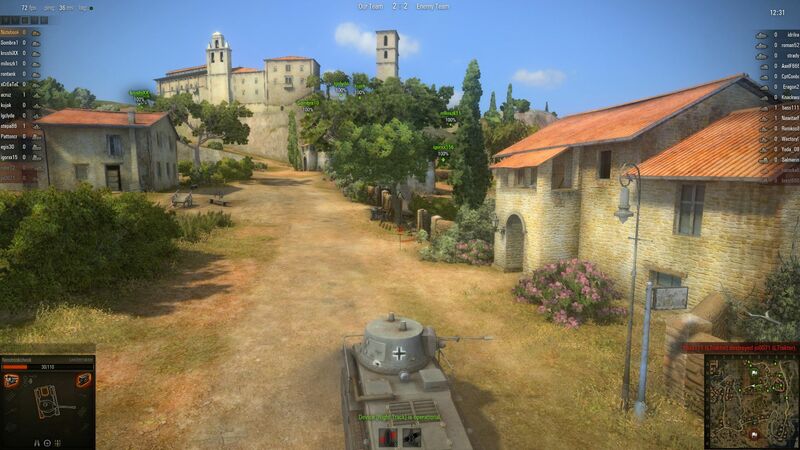 Those of you who do not demand high graphics settings can play World of Tanks even with a low-end graphics card without any problems. 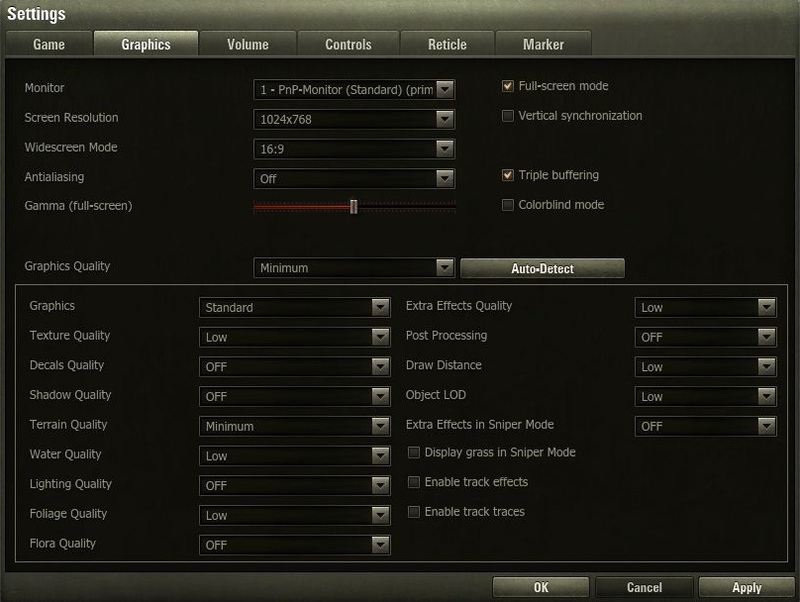 The minimum preset should not even be a problem for the HD Graphics 3000 or 4000. However, for the considerably nicer medium preset a better GPU is required. Our replay was displayed fluently using one of the upper mid-range GPUs. 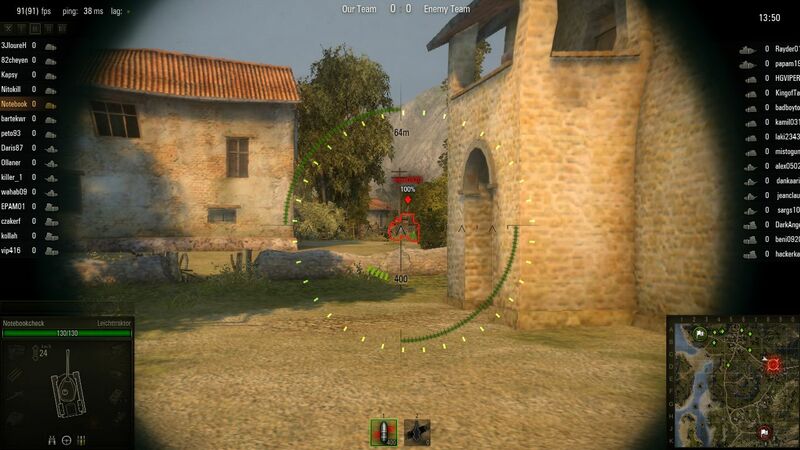 All graphics cards below the GeForce GT 650M did not achieve more than 30 fps with a resolution of 1366x768 pixels. High details demand a high-end GPU such as the GeForce GTX 660M. 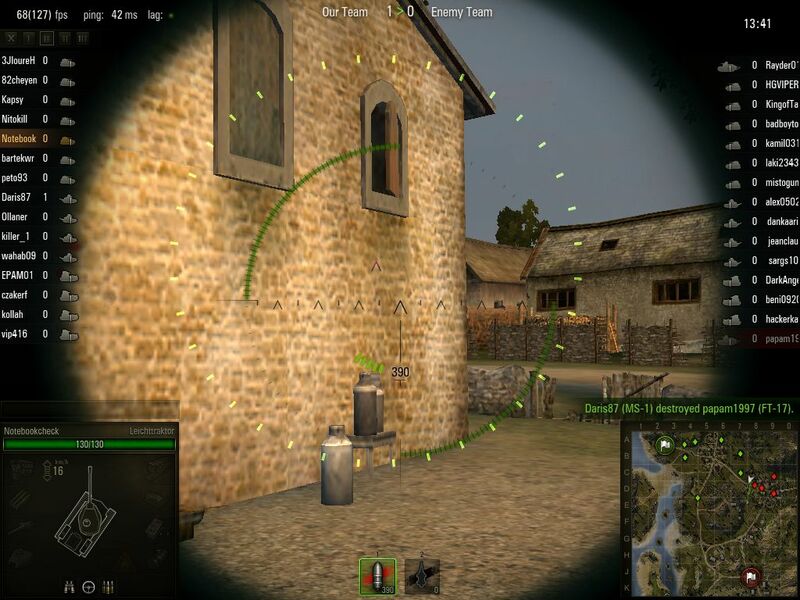 A resolution of 1920x1080 pixels and the maximum details setting was only displayed fluently by the top models GeForce GTX 680M and Radeon HD 7970M . 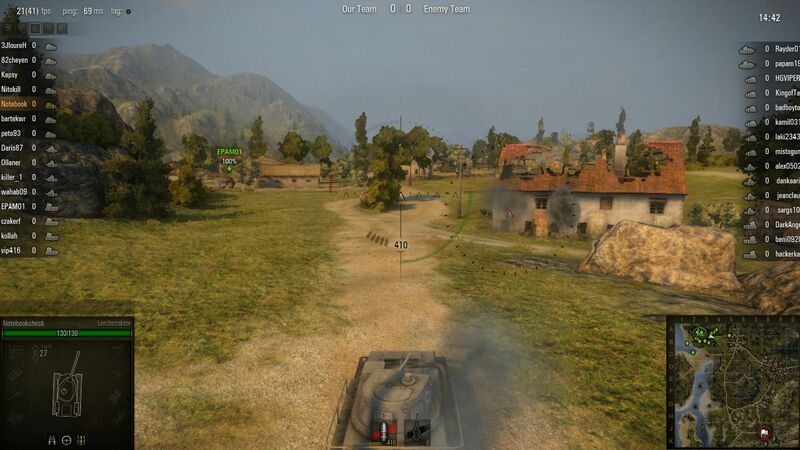 Considering Radeon: as can be seen in the benchmark table, World of Tanks belongs to one of the few games that can get along with the AMD-GPUs. 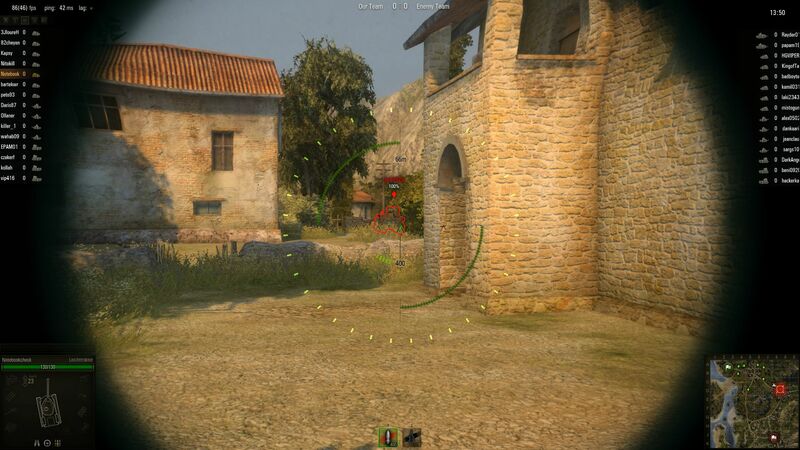 As a result the apparently weaker or older graphics cards such as the Radeon HD 7660G or the HD 5650M got higher fps rates than its Nvidia competitors (in this case the GeForce GT 630M). 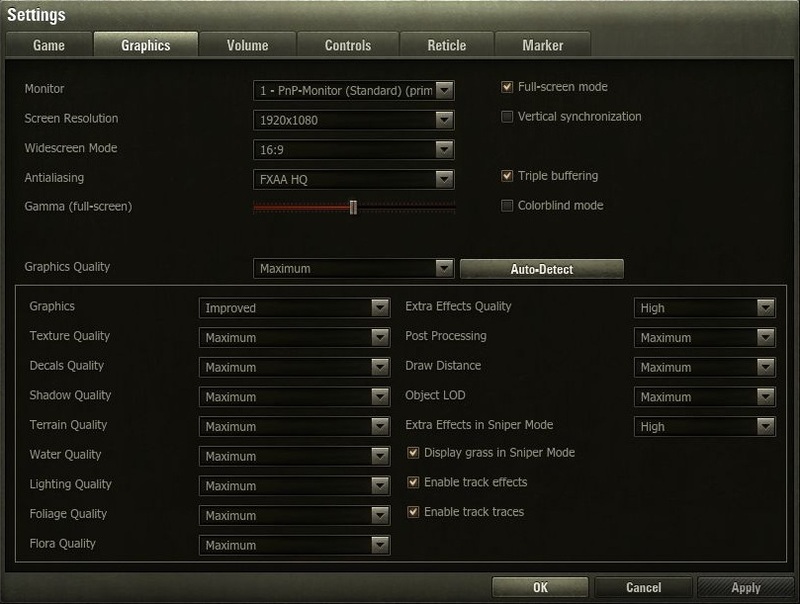 The difference between the HD 7970M and the GTX 680M are 20 fps with the maximum settings. 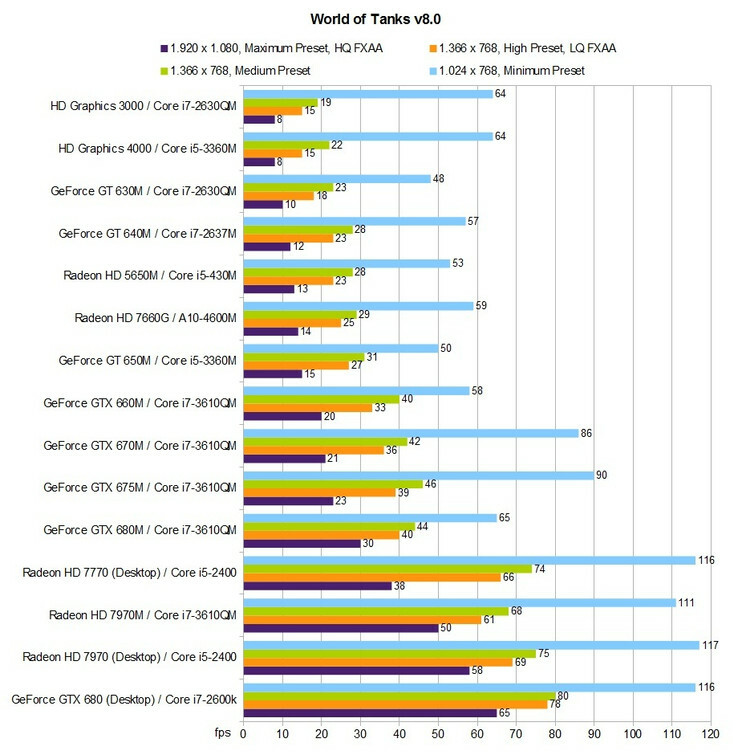 Update 13.10.2012: Some GTX 680M users report a significant higher performance. Since we tested three different drivers und installed W.o.T. on another HDD, the problem should be up to Optimus or our GPU-example. We will adjust the article, if changes appear. Verdict: in order to enjoy all of the graphical and technical improvements you will need to have a good multimedia notebook or a gaming notebook. GPU driver of the three platforms: 306.23 (Nvidia), 12.9 Beta (AMD) respective 8.15.10.2761 (Intel).